In the world of Plants vs Zombies, it's always been about the plants being on the defensive against the invading zombie horde. 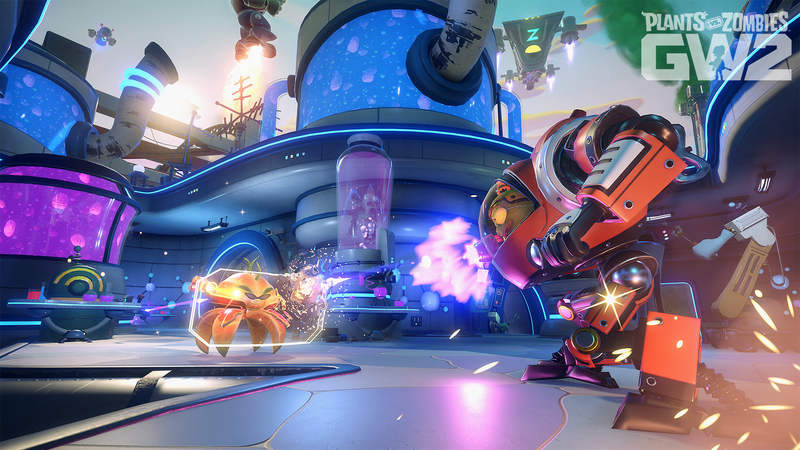 Even last year's Plants vs Zombies: Garden Warfare featured a cooperative horde mode called Garden Ops, in which players took control of plants from a third person perspective, set up turrets, and defended against wave after wave of zombies. In the upcoming Garden Warfare 2, however, the tables have finally turned. GW2 takes place in a world where Dr. Zomboss has finally found a way to turn the tide of the battle. and has actually succeeded in taking over Suburbia, or as its now called, Zomburbia. But of course, the plants aren't just going to take this occupation lying down, and so it's finally their turn to go on the offensive and let the zombies know what it's like to have their home invaded by an opposing force. In my hands on time with Garden Warfare 2, I got a chance to play several rounds of Graveyard Ops, which as you might imagine, is Garden Ops with the roles switched. It's once again a coop focused horde mode, only this time you play on the side of the defending zombies against wave after wave of invading plants and weeds. There will be six new classes introduced in Garden Warfare 2 at launch, three on the plants side and three on the zombies side, along with returning classes from the original game. The new classes include: Imp, a tiny and underpowered zombie with the advantage of having technology from the future, including a badass mech that can be summoned in at any time; Citron, a genetically modified orange who also happens to be a cyborg bounty hunter from the future; Captain Deadbeard, a zombie pirate who's been lost at sea for centuries; Rose, an all powerful ancient sorceress that has the unique ability to polymorph zombies into goats; Super Brainz, a zombie super hero with super strength and energy blasts; and finally Kernel Corn, who is an old veteran who returns home to find that zombies have taken over suburbia. Since the only mode that was available for play during my demo was Graveyard Ops, I only got a chance to use the new zombie characters, all of which felt very unique and were a lot of fun to use. Playing as Imp is actually like playing as two characters in one. While on his own, Imp use his rapid fire blasters to chip away at enemies from afar, but can also suddenly go into a breakdance while firing his guns in all directions to take out a whole pack of weak enemies all at once. When things start to take a turn for the worse, a simple press of a button will call down Mech Z, which comes with a whole new set of moves and a massive increase in health. Captain Deadbeard on the other hand is a sniper class with tons of utility. His main weapon is a hybrid sniper rifle/shotgun that can zoom in to hit enemies from far away while scoped, or shot from the hip for a close range spread shot. He can also jump into a barrel filled with TNT for a timed detonation and hop on to a cannon to lay siege on slow moving or stationary targets for massive damage. His most impressive ability though involves allowing the player to control his parrot and take to the skies for a literal birds eye view, and drop bombs anywhere on the battlefield. Finally, there's Super Brainz, who is a behemoth of a zombie, capable of dealing big damage up close with his melee strikes, or from afar with a continuous energy beam. He can also leap into the fray with a diving jump kick, blast away enemies with a huge explosive energy blast, or spin around like Taz and deal damage to anything he gets close to. Other than the role reversal, not much has changed in Graveyard Ops compared to Garden Ops. Players can still place a variety of turrets to aid them in their defense, you'll still be fighting a boss on every fifth wave, and at the end of it all, you'll need to rush to an evacuation point in order to clear the level. One of the biggest flaws of the original Garden Warfare was the fact that if you wanted to play it as a solo player, you were pretty much out of luck. That's changed in Garden Warfare 2, where every mode is playable as a single player with bots. In addition, you'll also be able to play through each mode in split screen with a buddy. So far it seems like Garden Warfare 2 is shaping up to be a solid entry in the series, addressing some of the issues that held the original back, while largely adopting a "if it ain't broke, don't fix it," mentality. 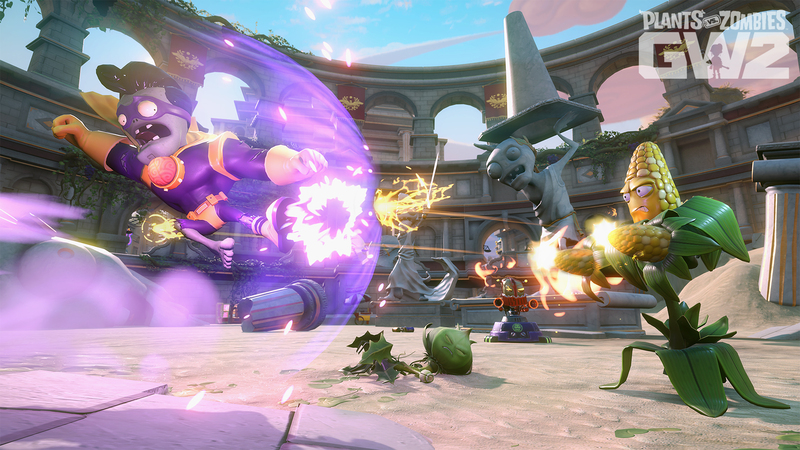 With free post launch updates, the ability to transfer unlocked characters over from Garden Warfare 1, fans of the series will no doubt find a lot to love when Plants vs Zombies: Garden Warfare 2 launches on Xbox One, Playstation 4, and PC in Spring 2016.